Throughout the year, Potter Park Zoo hosts many private and public events. A wide variety of volunteers are needed for these, from greeters to craft assistants; face painters to storytellers; ticket takers to registration helpers and more! No matter what your gardening skills, we can use your help on our zoo grounds! Take on your own garden space or simply help us weed and rake. You choose the task and your schedule. Looking for a little more? Consider our Adopt-a-Garden program! Occasionally we have special projects of all kinds were we could use helpers – from conservation projects; to painting; to organizing and sorting – there are a variety of opportunities. Our office staff sometimes need help preparing mailings, memberships or other clerical projects. If you can sort and shuffle, we can use your help! 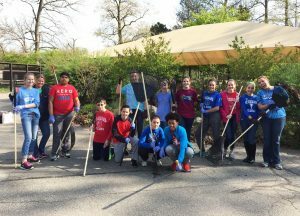 The Zoo Teen program at Potter Park Zoo has two different facets, giving teens a great opportunity to explore some of the many career pathways available at a zoo! Sound like fun? Check it out! These programs are open to teens ages 14-18 and require a separate application process. Please visit this page for more information. All new Individual Volunteers (except Zoo Teen Program & Junior Zookeeper Volunteers) must first complete the Individual Volunteer Application (see below for Group Volunteer information). After your application has been submitted, you will receive a welcome email, as well as a request for information to complete a required background check. Once we have received your background check results and have approved your application, you will be invited to attend a mandatory orientation. (Groups have a different process – see below) At orientation, a $20 Volunteer Orientation Fee will be collected. This fee covers your on-boarding process and your uniform t-shirt. Volunteer Orientations are typically held a few times a month. At orientation we cover important information about volunteering at the zoo, give an overview of how we operate, show you how to sign up for opportunities available all year round, and take a tour of the zoo. 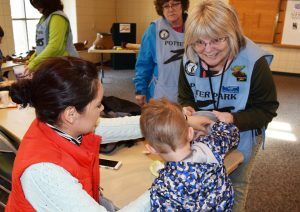 Potter Park Zoo welcomes corporate, student, and other community groups to volunteer for a day and connect with our mission. The first step is to complete the Group Volunteer Application Form (by clicking this link). Please note: The individual completing the application will be considered the contact person for your group, but can be changed at a later date. Orientation is not required for group volunteers. Do I get to interact with any of the animals? Unfortunately, our volunteers do not interact with our exhibit animals. However, we always encourage volunteers to come see our zoo residents during their free time. Volunteers under the age of 18 must be accompanied by a parent or guardian during the entirety of their volunteer shift. How do I sign up to become an individual volunteer? Fill out a Individual Volunteer Application on our website. Once we have received your application and completed your background check, the Volunteer Coordinator will contact you to sign-up for orientation. As a volunteer, there are no minimum amount of hours you must complete. Volunteers self-schedule, so you can volunteer when your availability allows. Do you offer court-mandated community service opportunities? We do not offer court-mandated community service opportunities at this time. No problem! We don’t require a minimum amount of hours per year, making volunteering at the zoo easy! Volunteers self-schedule based upon their own availability and interest in events. Fill out our Volunteer Application online to join our Volunteer Team (Please see separate sections to the left of this page for Group Volunteering, Zoo Teen and Teen Zookeeper Programs)!